When traveling to a country for the first time, it’s a good idea to pay special attention to their “street food.” In Paris, for example, the tiny shops selling crepes (sometimes slathered with Nutella!) are a delight as one strolls along the avenues. Many big cities are filled with such delicacies, and in fact, one of my favorite cookbooks revolves around this topic. On the streets of Brazil, you might stop to buy a “pastel,” and after sampling it, immediately return to the vendor for a couple more (plural = pasteis). 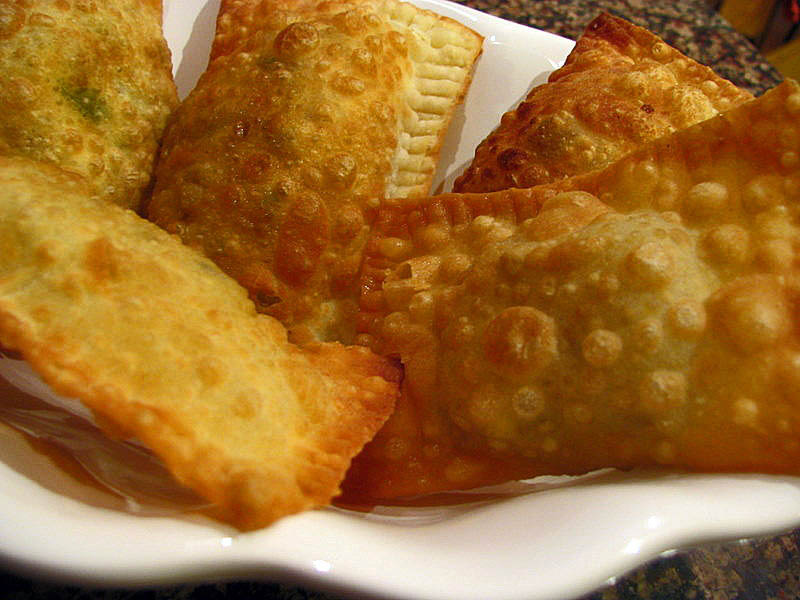 These fried savory pastries are sold at the entrance of street markets: every week on the same day a few blocks of a neighborhood street close to traffic, while farmers sell their produce from early morning until slightly past noon, with prices dropping as the hours pass. You’ll smell the pasteis from a distance, and it’s impossible to resist eating more than just one… The vendors are usually hard working Chinese-Brazilians, with red faces from the intense heat in their huge woks. Growing up in our house, my memories of pasteis go well beyond the street markets. Luisa, a cook who worked for my Mom every Saturday, often made them, and always from scratch. She used no machines or special gadgets, but only her strong arms, a rolling pin, and a fantastic disposition. Luisa routinely prepared two batches, one for the whole family, and another for my Dad, which no one else would touch. What was so special about his pasteis? They were filled with minced peppers, and I am not talking jalapenos, poblanos, or serranos. Those were incendiary Brazilian peppers that can make a grown man cry. Dad was absolutely addicted to them. Besides his love for hot peppers, he loved a good laugh. You might see where this is headed: he’d sneak into the kitchen to steal a couple of pasteis as Luisa was busy frying them, and then hide one of his “special ones” in the middle of the normal batch. He later patiently waited for a very unlucky camper to bite into it. Although everyone was on high alert at the beginning of the meal, we always seemed to forget until someone started howling in pain! Dad, laughing to the point of tears, insisted that he didn’t do it, that Luisa had certainly made a mistake. 😉 The best times were when Mom got the fiery one… Normally soft-spoken and even-tempered, a mouthful of hot pepper really made her fume, literally. It’s been almost six years since my Dad left us, but the memories will never fade. Mix all ingredients together until very smooth. Allow the dough to rest for 30 minutes to 12 hours in the fridge, covered by plastic film. Using a pasta machine, open small portions of the dough – on a Kitchen Aid, I roll up to number 5, not thinner. Place the dough on a floured surface and cut into squares. Add the filling of your choice to the center of the square and close the dough around it, pressing the edges with the tines of a fork to prevent it from opening as you fry it. Make absolutely sure there are no holes for the oil to sip in, or they will be soggy. Fry in extremely hot oil until golden, turning them only once. Remove to a tray with paper towels to absorb excess oil. Pasteis can be kept in a 200F oven while you fry the full batch. Saute the onions in the oil until translucent. Add the ground beef, and saute until cooked through. Add the tomato paste, green olives, salt and pepper and cook in slow-heat for 10 minutes. Add the boiled egg, mix well. Make a slurry with water and cornstarch, add to the ground beef mixture, cooking for a few minutes, until it thickens slightly. Let it cool completely before using. Leftover filling can be frozen. 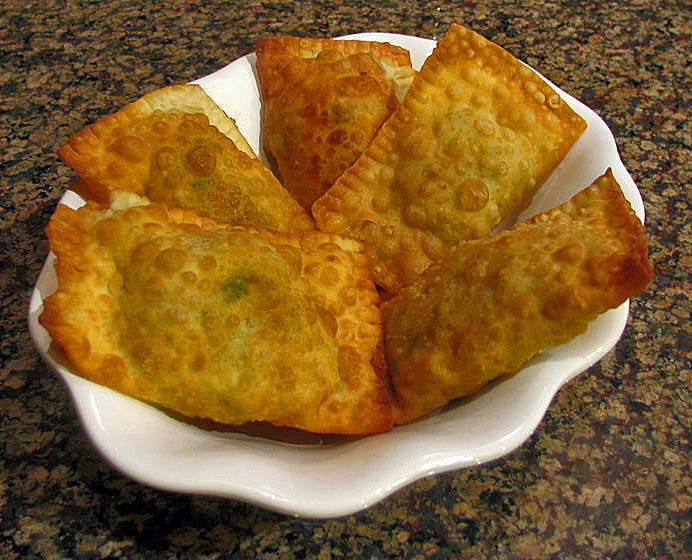 Comments: If you don’t want the trouble of making the dough, won ton skins will work reasonably well, and they are quite easy to find in grocery stores. But, this recipe will produce an authentic version, with a crust full of blisters and slightly more “substance” than you’ll get from won ton skins. Pasteis can be filled with many different things. Pastel de queijo (cheese pastel) is very popular in Brazil: just enclose a piece of mozzarella with a sprinkle of oregano, and remember that it will be very hot once it’s done frying. Hearts of palm is another popular filling (pastel de palmito) that I’ll definitely post about in the future, because I’m very fond of it. Your own imagination is the limit: roasted chicken with a little cream cheese, cooked shrimp with tomatoes and herbs, all veggie….. Have fun with it! Pasteis can be made in a small size that’s perfect as an appetizer with a cold caipirinha on the side. 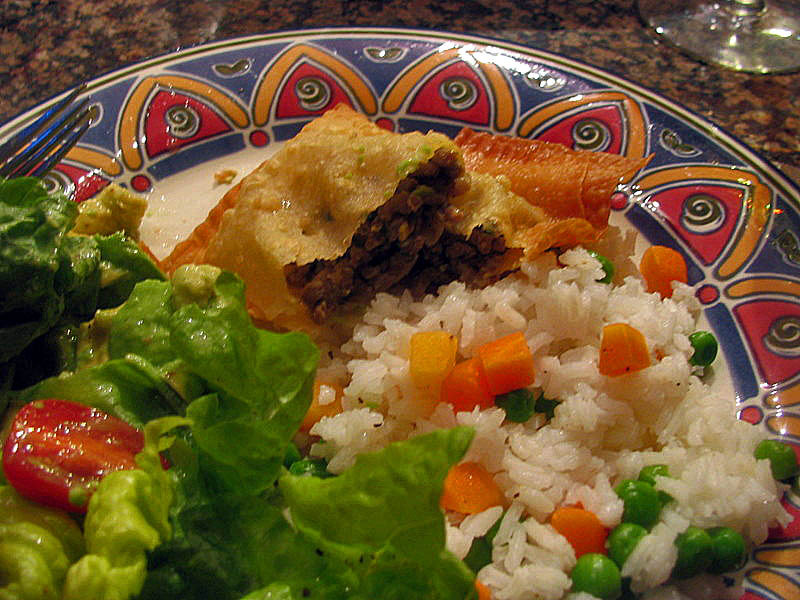 But my favorite pasteis are as part of a full meal, with rice and a fresh salad. Tropical paradise on a plate! For more photos, follow the slide show…. And for a quick lesson on Brazilian Portuguese, click on the sound files down below. Amassar bem os ingredientes. Deixar a massa descansar por 30 min. a 12 hs na geladeira, coberta com filme plástico. Abrir a massa em máquina de macarrão, até obter tiras bem finas. Dispor as tiras sobre superfície enfarinhada e cortar em quadrados. Colocar uma porção do recheio de escolha no centro de cada quadrado, formar os pasteis e pressionar as extremidades com garfo, para que fiquem bem selados. Fritar os pastéis em óleo quente e colocar sobre papel absorvente. Refogar a cebola no azeite ate’ ficar transparente. Fritar a carne, acrescentar as azeitonas, cheiro-verde, massa de tomate, sal e pimenta. Refogar por 10 minutes, adicionar o ovo cozido picado. Juntar a maisena dissolvida na água e manter em fogo brando por mais 5 minutos. Retirar do fogo e deixar esfriar por completo antes de usar. Sobras podem ser congeladas. Celia, you can definitely roll it out by hand – it is a very similar texture to pasta dough, although easier to work with (more “elastic”). As a Brazilian-pastel-lover (specially those filled with minced meat) and also addicted to hot pepper sauce, I’m delighted to hear this story. I could actually see Mr Newton, with whom I had the privilege to share a pastel feast and get stuffed myself, while reading it…Wonderful memories. Pastel is one of those things that you run for as soon as you step on Brazil again. Lindos estes pastéis, vou testar a receita. went through your pastel recipe, but I don’t think you included enough liquid? Perhaps hot water needs to be added to your ingredient list? amazing that no one caught it until now…. 😦 Thanks so much for letting me know! Oi Sally! Sou brasileira, fazendo intercâmbio aqui nos EUA (inclusive estou estudando pra fazer pesquisa em biologia molecular também!). Estava procurando uma receita pra massa de pastel e achei seu blog. Vou tentar fazer o pastel, porque a saudade é muita! Obrigada!